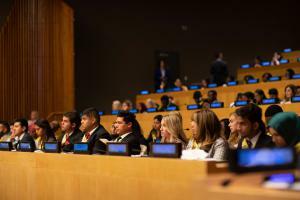 Youth Take a Stand in Favor of Human Rights Education at the United Nations, Gain International Attention. 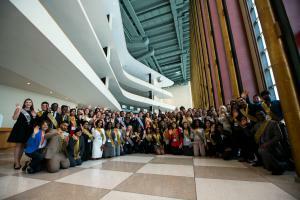 Young activists were selected based on their accomplishments in the field of human rights. They represented their countries at the Summit. More than 100 young people were selected: youth delegates who represented their countries, and youth ambassadors, former delegates who have continued to serve as human rights activists. Youth representing 60 nations gathered at the UN to celebrate the 15th Human Rights Summit and 70th anniversary of the Universal Declaration of Human Rights. 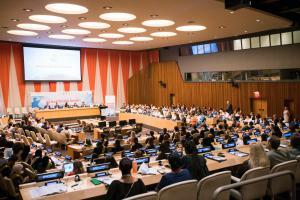 UNITED NATIONS HQ, NEW YORK , USA, July 19, 2018 /EINPresswire.com/ — NEW YORK, July 6, 2018 More than a 100 young men and women filed into the iconic Economic and Social Council Chamber at the United Nations in New York July 5th and 6th for the International Human Rights Summit hosted by Youth for Human Rights International. There youth were welcomed by dignitaries and guests with a standing ovation. Through their commitment to raising awareness and understanding of the Universal Declaration of Human Rights, they represent the hope for a humane and peaceful future. Youths at the summit were selected to represent their countries on the basis of their own human rights accomplishments toward making human rights a fact. Among these youth delegates were youth from Washington DC, there to represent the human rights work being done in the Nation’s Capital. They were welcomed by the summit’s sponsor the Permanent Mission to the United Nations of Costa Rica and its co-sponsors the Permanent Missions to the UN of Cyprus, Australia, Morocco and Romania. Erica Rodgers, National Director of Youth for Human Rights in Washington, DC, highlighted the importance of education saying, "We cannot let our society be ignorant of human rights. We would be denying them their own freedom and potential happiness. It is our responsibility to make human rights known through whatever actions we take – big or small." She discussed the need for education in the basic rights listed in the Universal Declaration of Human Rights as grounding in today's political climate as well as plans to launch future education initiatives in schools. YHRI has now grown into a global movement with over 150 chapters and its educational materials, translated into 27 languages, bring the message of human rights to 195 nations. The Youth for Human Rights public service announcements and The Story of Human Rights educational film air on several hundred television stations in dozens of countries each year.